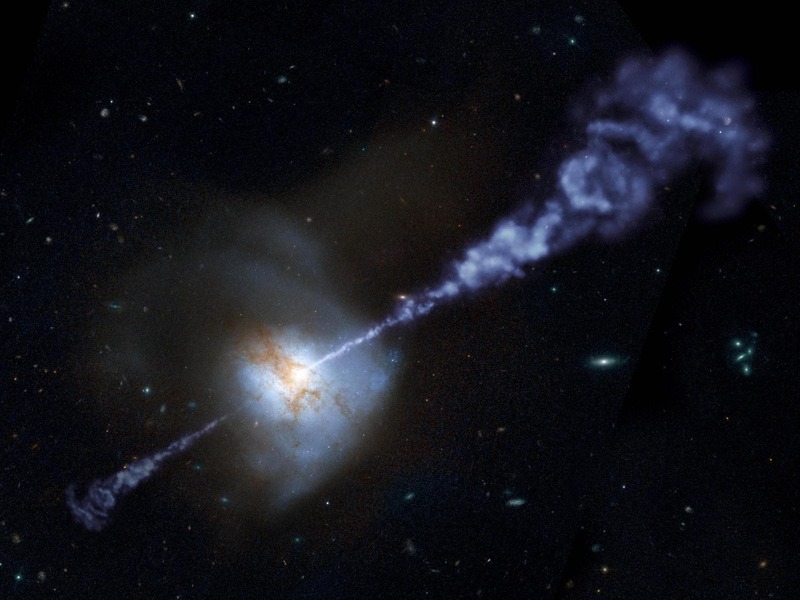 Astronomers examining the properties of black hole jets compared 54 gamma-ray bursts with 234 active galaxies classified as blazars and quasars. Surprisingly, the power and brightness of the jets share striking similarities despite a wide range of black hole mass, age and environment. Regardless of these differences, the jets produce light by tapping into similar percentages of the kinetic energy of particles moving along the jet, suggesting a common underlying physical cause. A new study using data from NASA's Swift satellite and Fermi Gamma-ray Space Telescope shows that high-speed jets launched from active black holes possess fundamental similarities regardless of mass, age or environment. The result provides a tantalizing hint that common physical processes are at work. The finding simplifies astronomers' understanding of black holes by showing that their activity is governed by the same set of rules—whatever they happen to be—independent of mass, age, or the jet's brightness and power. The jets tap into similar fractions—between 3 and 15 percent—of the energy wrapped up in the motion of their accelerated particles to power the emission of gamma rays and other forms of light. "What we're seeing is that once any black hole produces a jet, the same fixed fraction of energy generates the gamma-ray light we observe with Fermi and Swift," said lead researcher Rodrigo Nemmen, a NASA Postdoctoral Program (NPP) fellow at NASA's Goddard Space Flight Center in Greenbelt, Md. Gas falling toward a black hole spirals inward and piles up into an accretion disk, where it becomes compressed and heated. Near the inner edge of the disk, on the threshold of the black hole's event horizon—the point of no return—some of the material becomes accelerated and races outward as a pair of jets flowing in opposite directions along the black hole's spin axis. These jets contain particles moving at nearly the speed of light, which produce gamma rays—the most extreme form of light—when they interact. "We don't fully understand how this acceleration process occurs, but in active galaxies we see jets that have operated so long that they've produced trails of gas extending millions of light-years," said Sylvain Guiriec, an NPP fellow at Goddard and a co-author on the study, which was published in the Dec. 14 issue of Science. At the other end of the scale are gamma-ray bursts (GRBs), the most powerful explosions in the universe. Astronomers believe that the most common type of GRB heralds the death of a massive star and the birth of a stellar-mass black hole. When the star's energy-producing core runs through its store of fuel, it collapses and forms a black hole. As the star's overlying layers cascade inward, an accretion disk forms and the black hole launches a jet. The particles in some GRB jets have been clocked at speeds exceeding 99.9 percent the speed of light. When the jet breaches the star's surface, it produces a pulse of gamma rays typically lasting a few seconds. Satellites like Swift and Fermi can detect this emission if the jet is approximately directed toward us. 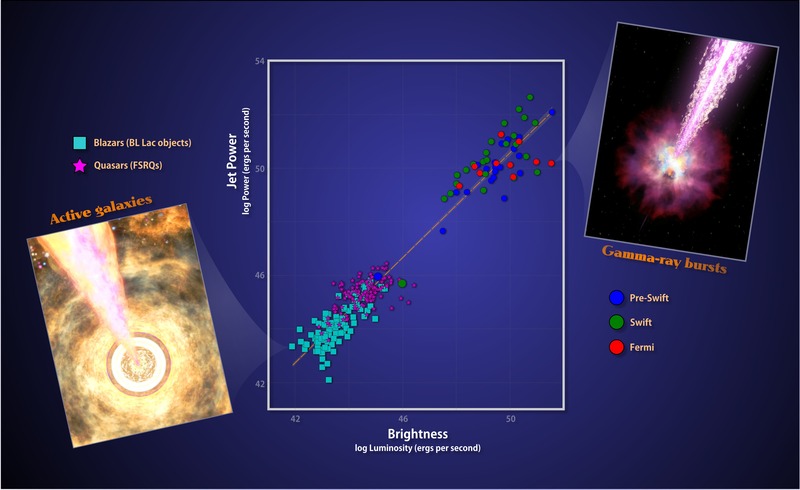 To search for a trend across a wide range of masses, the scientists looked at the galactic-scale equivalent of GRB jets. These come from the brightest classes of active galaxies, blazars and quasars, which sport jets that likewise happen to point our way. To match the amount of energy given off by a typical blazar in one second, the sun must shine for 317,000 years. To equal the energy a run-of-the-mill GRB puts out in one second, the sun would need to shine for another 3 billion years. Ultimately, the team examined 54 GRBs and 234 blazars and quasars. The gamma-ray brightness obtained with Fermi, Swift and other observatories told the scientists how much light the jets radiate. Radio and X-ray observations allowed them to determine the power of the particle acceleration in each jet. By analyzing how these two properties related to each other, the researchers discovered that the GRB and blazar samples both exhibited the same relationship. "Here we have a situation where the mechanism that launches material from a black hole either has to be very similar on both ends of the mass scale—from a few to a billion solar masses—or we need different mechanisms that manage to produce very similar efficiencies," explained co-author Eileen Meyer, a post-doctoral researcher at the Space Telescope Science Institute in Baltimore. "It's a bit like a poor man and a billionaire spending the same percentage of their incomes on their heating bills," said team member Markos Georganopoulos, an associate professor of physics at the University of Maryland, Baltimore County. The authors hope to extend the research to other black-hole-powered events that launch jets, such as the tidal disruption of stars by supermassive black holes. "One especially useful outcome of this research will be to foster greater communication between astronomers studying GRBs and those working on active galaxies, which in the past we've tended to regard as separate areas of study," said co-author Neil Gehrels, the principal investigator on NASA's Swift.